As I really want to keep this post short I stick with the exact implementation on my blog. 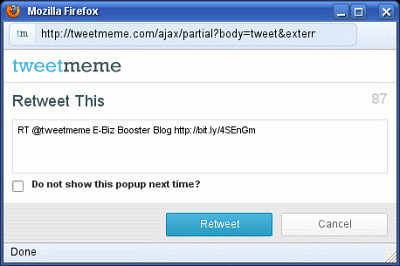 There are more than one ways of implementing the Tweetmeme functionality on a website. You can figure out the rest by consulting the Tweetmeme Help pages on their website. Users of Wordpress blog software have the convenience of managing this with a Wordpress plugin instead. The button grabs the URL of the page. That means if you have more than one button on a single page—like on a blog index page—you need to specify the URL of the post. That's what this variable is here for. The URL must not be a redirected URL, like from tinyurl.com but a regular webaddress returning a 200 OK HTTP status response code. The default user—and many webmasters leave it that way—is 'tweetmeme'. Change it to your user. There is an additional variable for a compact button, but I never have noticed anyone using it. Now the button is configured correctly and suggests the following text for the retweet. After fixing the configuration I noticed that the "headline" in the retweet-it-window did not change. I still got the title of my blog suggested rather than the title of my blog post. That's because the "wrong title" was already indexed at Tweetmeme. An entry for this index is created at the first time a new URL shows up. Either on Twitter or vie a Tweetmeme button. A quick test confirmed that theory, and later I found the corresponding section in the FAQ and the remedy of the problem. Other users have had that same problem before as I could see at the Tweetmeme Button FAQ (↑). Why is TweetMeme not picking up the correct page title? 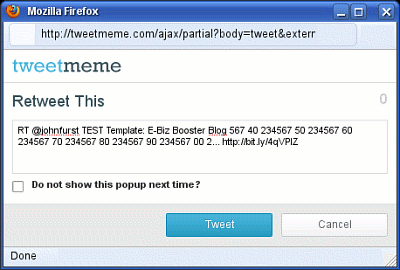 TweetMeme caches page information (including the title) to reduce load on the site that is using the button. If you have updated your page titles, you can force TweetMeme to update by using our ping service (↑). This worked like a charm and I had updated the wrong post titles in the index within a couple of minutes. Now that issue is fixed. I got the wrong post title in the tweetmeme index from my blog post drafts. My blog returns a “soft” error page on posts that are not published yet. The title of those is “E-Biz Booster Blog”. Now I have disabled the display of the tweetmeme button on drafts. That's what tweetmeme picks up. 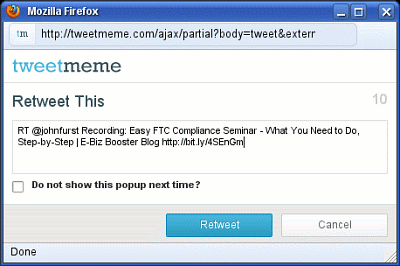 Tip: Check the tweetmeme text after publishing a new page. If necessary, correct it, and do a ping. Check your workflow. The button only should be displayed on finally published pages. After changing the title of a page you need to ping tweetmeme. But I am still not entirely satisfied. Tweetmeme will use all 140 characters Twitter allows if necessary. Personally I try to keep all my tweets at 120 characters maximum length. This makes it easier for my followers on Twitter to retweet it. I don't think too much about it. I simply leave some extra space. To avoid abuse tweetmeme is restrictive in what you can do. You can cut down your title. Nothing else. You cannot even exchange a single character or change the order of words. You can use an HTML meta element to specify an alternative title. What I currently do is to drop the blog title. You achieve this by adding a XHTML meta element into the head section of your website page. Details are described in Customising Button Title (↑). Don't forget the new title must be an exact subset of the title in the HTML title element of the webpage. Later today I will add a function in my blog template which cuts the that guarantees that truncates the title so that the entire tweet string won't exceed the 120 character limit I care about. It's a bit unlikely that I will ever hit that limit, but who knows. Let's figure out how long the blog title can be. I need to truncate the page title down to 84 characters. Here is what I do in Serendipity. Wordpress users are most likely using the plugin. No need to give them code. A tip for Serendipity users: The Smarty truncate function puts '...' (three periods) at the end of the truncated string (included in it's specified length). This would violate Tweetmeme's restrictions of not modifying the string. The second parameter "" (empty string) overwrites that behavior and leaves the string unmodified. The function cuts off at a word boundary. Tweetmeme also offers a premium analytics package for Twitter (↑) but I do not currently intend to use it.